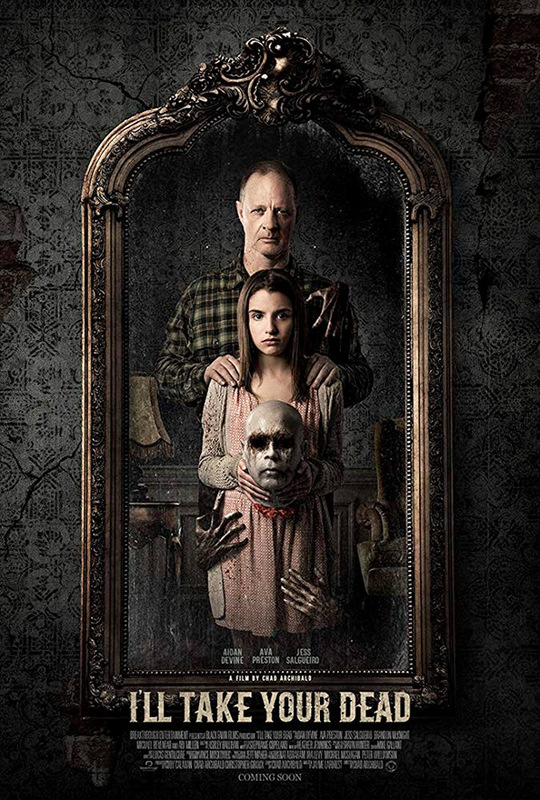 "She's seen so much death here…" Scream Factory has debuted an official trailer for the indie horror thriller I'll Take Your Dead, the latest film from Canadian horror filmmaker Chad Archibald (The Drownsman, Ejecta, Heretics). This originally premiered at two Canadian film festivals last year - Calgary and Toronto After Dark - and is getting a limited release in May. The concept for I'll Take Your Dead is pretty twisted - a guy who cleans up dead bodies at a farm house gets one dumped there. But this woman isn't actually dead, and so patches and locks her up until he can figure out what to do. The two begin to develop a very unusual respect for each other, but the killers come back to finish the job. Aidan Devine stars, with Ava Preston, Jess Salgueiro, Brandon McKnight, and Ari Millen. Looks like this has some creepy twists and turns. William (Aidan Devine) has a simple job, he makes dead bodies disappear. This isn't something he likes to or even wants to do, but through circumstances out of his control, his little farm house in the country has become a dumping ground for the casualties of the gang related murders in the nearby city. His daughter Gloria has become used to rough looking men dropping off corpses and is even convinced that some of them are haunting their house. After a woman's body, is dumped at the house, William begins his meticulous process when he realizes, she's not actually dead. As the gang activity increases, William patches the woman up and holds her against her will until he can figure out what to do with her. As they begin to develop a very unusual respect for each other, the woman's murderers get word that she's still alive and make plan to go finish what they started. I'll Take Your Dead is directed by Canadian producer / filmmaker Chad Archibald, director of the indie films Neverlost, Kill, The Drownsman, Ejecta, Bite, and Heretics previously. The screenplay is written by Jayme Laforest, based on a story by Chad Archibald. This premiered at the Calgary Film Festival and Toronto After Dark Film Festival last year. Scream Factory will release Archibald's I'll Take Your Dead in select theaters + on VOD starting May 3rd coming up. Anyone?